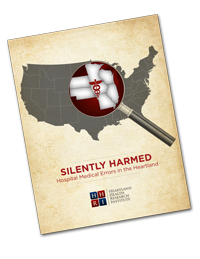 ‘Silently Harmed – Hospital Medical Errors in the Heartland’ was published in February 2016. ‘Silently Harmed’ is intended to demonstrate what the national estimated preventable adverse events (PAEs) may mean to each of the seven midwestern states. The analysis purposely serves to launch a new dialogue as the healthcare delivery system evolves from post-Affordable Care Act legislation. ‘Silently Harmed’ ‘reverse engineers’ national estimates of the number of patients both fatally and seriously harmed in U.S. hospitals and extrapolates those numbers into local estimates for Iowa and each of its six neighboring states: Illinois, Minnesota, Missouri, Nebraska, South Dakota and Wisconsin. Making our healthcare delivery system safer requires a more accurate measurement of the actual prevalence of medical errors within each state. To date, we have little information to serve as a benchmark within each state to begin efforts toward progress. To legitimately improve quality outcomes, we must measure what matters most, not just what is most convenient. This is a difficult undertaking and many times we confuse activity with progress, which only prolongs egregious results. ‘Silently Harmed’ endeavors to prompt greater awareness and discussion so measurable improvements can quickly advance forward. 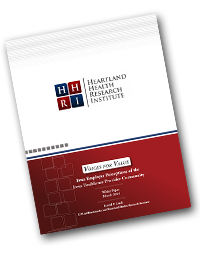 The white paper, ‘Voices for Value’ – Iowa Employer Perceptions of the Iowa Healthcare Provider Community, was published in April 2014. ‘Voices for Value’ was part of the 15th annual Iowa Employer Benefits Study© conducted by David P. Lind & Associates, LLC (dba David P. Lind Benchmark). This groundbreaking Iowa survey – summarized in ‘Voices for Value’ – amplifies the employer voice and provides critical insight for the healthcare provider communities that serve employers. Employers clearly do not see enough healthcare value with what is currently being delivered. This ’emerging voice’ established a baseline of expectations that, until now, has only been anecdotal without clear factual evidence.